Gabions are rectangular wire mesh baskets filled with rock at the project site to form flexible, permeable, monolithic structures such as retaining walls for commercial, industrial and road projects. They are also used for erosion control, bank stabilization, channel linings, and weirs. Maccaferri gabion strength comes from a double twisted hexagonal mesh of steel wire which is reinforced by selvedges of heavier wire running along the edges and by transverse diaphragms. The double twisted woven wire will not unravel, even when cut. Our gabions are very easy to assemble, require no specialized labor and nearby rock can be used for fill. 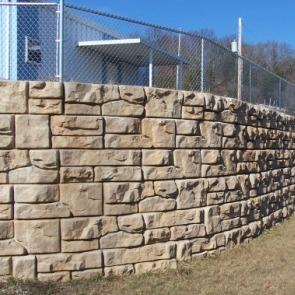 Maccaferri gabions are available with different levels of protective coating for durability. With 30% voids gabion structures offer free drainage providing a higher bank stability when used for river bank protection.